Rubber sheets are difficult to gauge with conventional thickness measurement techniques. However, with ultrasonic thickness gauges, any point on the entire surface, not just the edges alone, of a rubber sheet can be measured without ever having to contact the opposite side. Ultrasound waves travel through the sheets and reflect from the acoustic interface of the rubber and the substrate. It is important to know the exact nature of the application of the sheets on certain materials and also may require special setups in order to maintain accuracy of thickness readings. Ultrasonic thickness measurements on rubber can be done manually as well as semi-automatically. A high performance sheet is suitable for continuous use at temperatures from -80 degree F to 425 degree F and intermittent use from -100 degree to 500 degree F, depending on media and application. Suitable for use with many acids and alkalis. Resistant to ozone, oxidation, ultraviolet light, corona discharge, cosmic radiation and weathering in general. Neoprene : This is one of the most popular and earliest synthetic rubber, resistant to greases, inorganic chemicals and many oils. Neoprene is a good material to make sheets as it has good ageing, weathering and abrasion resistant characteristics. Neoprene rubber can be specially compounded to be flame retardant. Nitrile: Nitrile is another synthetic rubber used to make sheets. Many grades of this synthetic rubber are manufactured to meet various specific conditions. Nitrile is a good material to make sheets because it is resistant to oils, greases, liquid fuels and a wide range of industrial solvents. It can also be compounded to give mechanical and good abrasion resistant properties. White Food Quality Nitrile Rubber Sheets are ideally suited for use with oily or fatty foodstuffs, for example, dairy, meat and fishing industries. 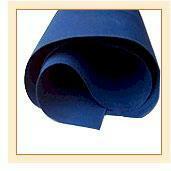 Ethylene Propylene Diene Monomer (EPDM): These sheets are also made of EPDM rubber. This type of rubber is weather, ozone, steam and chemical resistant. It also has a good electrical and low permeability characteristics. EPDM sheets are being used in increasing quantities by the engineering industry. Butyl: Butyl sheets are available in various widths and thickness. It can be fabricated to the required size using uncured butyl tape and a special heat bonding process. Viton: This is a very high grade synthetic rubber used to make sheets for the most demanding applications. It has excellent resistance to oxygen, ozone and natural weathering. It is ideal to make sheets because it is resistant to many of the more pernicious chemicals and solvents. This rubber is mainly used for hydrocarbons and oxidizing acids at high temperatures. Viton sheets are also flame resistant with the exceptional heat resistance. Silicone: A very popular type of synthetic rubber used to make sheets is silicone. This rubber is a heat resistant synthetic and suitable for temperatures ranging from -100°C to +200°c and above. It has inherent non-stick properties and also has good dielectric properties. Most grades are odorless and tasteless. Tensile properties are not high and silicone rubber has poor abrasion resistance but still ideal for rubber sheets.